During my time at South Shields Museum and Art Gallery as a history volunteer, I have come across some wonderful items. 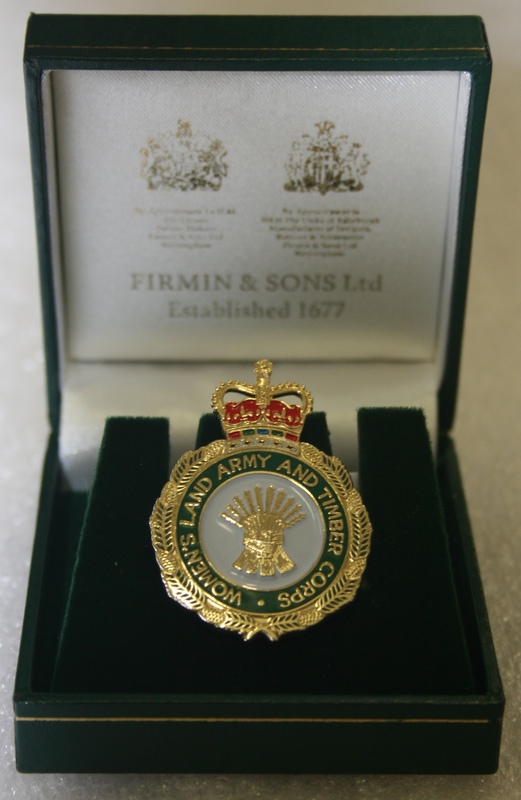 My favourite item was a Women’s Land Army and Timber Corps badge for a woman named Frances Blackburn (nee Shone). Although objects alone are lovely to work with, it is always nice when you get to know about its past and the people associated with it. The badge was especially interesting as the daughter-in-law of the owner was the person who donated the item, along with a newspaper article about her mother in law, Frances Blackburn, and her time as a ‘Land Girl’ in the Women’s Land Army (WLA). Frances Blackburn, Women’s Land Army. Taken from the newspaper clipping sent in with the badge. 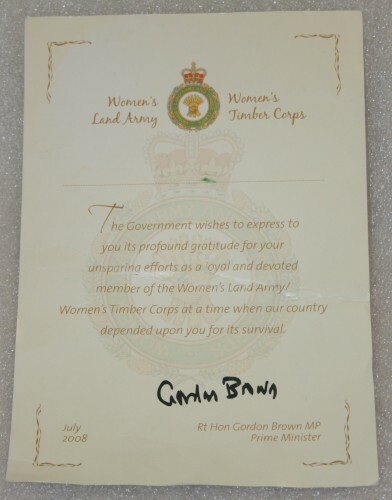 The Women’s Land Army was a civilian organisation which allowed women to take over agricultural work when the men left for war, during the First and Second World War. These woman were known as ‘Land Girls’. Frances was born in South Shields on Brabourne Street in November 1905 and died at the age of 102 in 2008, making her one of the oldest ‘Land Girls’. She went to Stanhope Road School and when she was a young women she worked in service for a family who ran a brickwork company in Boldon. 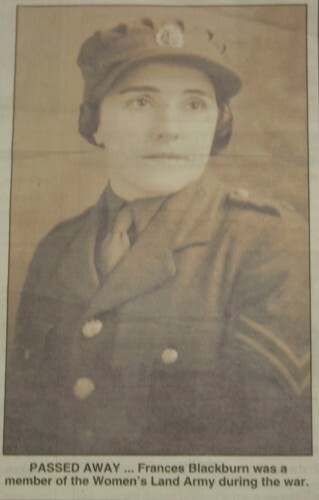 The newspaper article that accompanied the badge and certificate gave detail into the life of Frances Blackburn and her time in the Women’s Land Army. The article states that she became a land girl in 1943, during the Second World War, working on farms and other jobs on the land to replace the men who worked them, after they left to fight for their country. ‘The Government wishes to express to you its profound gratitude for your unsparing efforts as a loyal and devoted member of the Women’s Land Army/Women’s Timber Corps at a time when our Country depended upon you for its survival’. Obviously a very caring woman, after Frances left the Land Army, she stayed home to look after her ill mother, and when she died, Frances started working at Harton Dye Works, close to home in South Shields, until she married in 1964. In the article, Mrs Samanjoul said that Frances used to say, ‘what will be will be, always look on the bright side and keep the faith’ and she said that ‘nothing ever fazed her in life’. Frances Blackburn certainly is a heroine of South Shields. 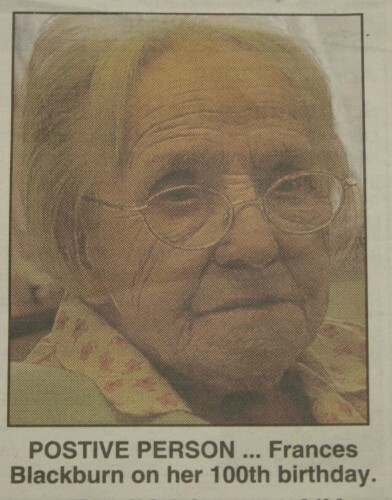 Frances Blackburn on her 100th birthday. 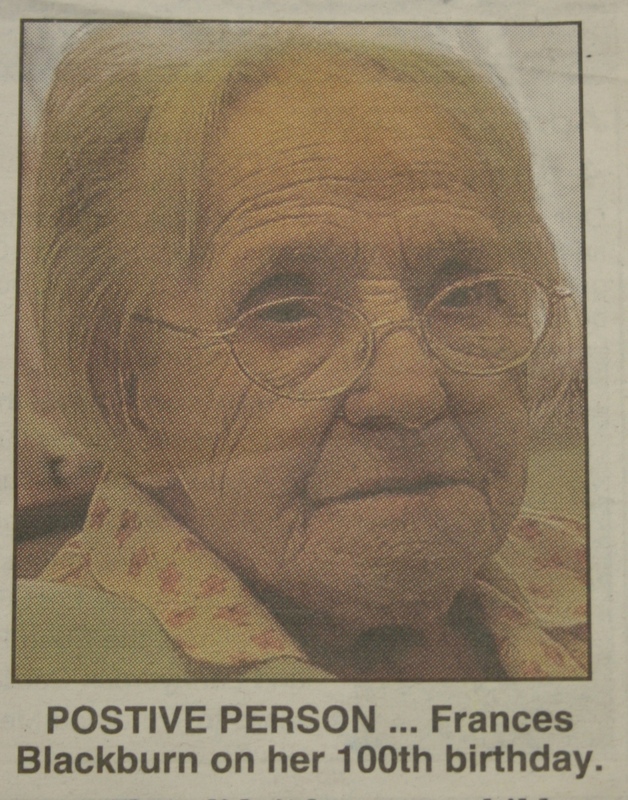 Taken from the newspaper clipping sent in with the badge.